Sweet arancini from Cremeria De Luca. Nutella, Italy's indulgent choc-hazelnut spread, has so many devotees it could almost claim to be a religious institution. With that in mind, here are 10 places of worship for Sydney's devout Nutella fiends. Pasticceria Papa's baked ricotta cheesecake is a sweet Sydney legend. The creamy, vanilla-scented cake also comes in a mini, no-need-to-share size with bonus runny Nutella centre. Papa's Nutella Bombe is a hit, too: an icing-sugar and cocoa dusted Italian doughnut filled with the good stuff. Sydney's love for Oregano Bakery's scrolls shows in the fact they're stocked in cafes across Sydney as well as at the bakery's Hurstville HQ. The Nutella-banana option is a serious indulgence – absolutely loaded with choc-hazelnut goodness. The crew at Marrickville's Old Garage Espresso (a new Carrington Road cafe) stock them and happily pile on extra Nutella by request – but really, these scrolls might be the most generously Nutella-laden hits around just as they are. Think you're "over" macarons? MakMak's will still knock your socks off. The new Nutella and salted caramel flavour is especially sensational – so much so it's looking like joining the regular line-up of "classic" flavours. The greyish-mauve coloured macaron is topped with chopped hazelnut and a hint of Frangelico, and the filling is a ring of salted caramel with a dollop of Nutella at the centre. Amazing. The picture behind the counter says it all: a Nutella jar next to a golden arancino, and the headline – "OMG!!" Yes, those irresistible Sicilian domes of rice with crisp-fried exterior have been given a sweet make-over – served warm with a thick, custard-like Nutella centre and sugary outer. The Nutella love continues with brioche bun "burgers" with Nutella, whipped cream and your choice of house-made gelato. What best to wash down all these Nutella treats with? Liquid Nutella! Pull over on busy Rocky Point Road for a fix at this corner cafe where they blitz up milk, ice and Nutella into a refreshing frappe. 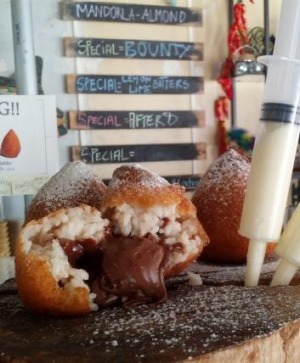 They also do Nutella doughnuts and cronuts if the drink just doesn't quite quell the craving! Muffins are the cafe staple that's reliably good but rarely anything to get kid-at-Christmas-time excited about. Until you add Nutella. Faves include the Nutella choc-chip beauts at both Putney's Dolcini, and Parramatta's Cafe Vieni, but with points for originality, the top pick is the indulgent muffin-shaped, croissant-textured, Nutella-filled and hazelnut-topped hybrid at Brewtown Newtown. Crepes and Nutella are a classic combination and you'll be hard pressed to find a better spot to try them than at this Frenchmen-run Mosman creperie. Add strawberries, banana or ice-cream to the mix – each is a great match for crepes topped with a hypnotising spiral of Nutella. Also on the menu: Nutella milkshakes. The Hungarian chimney cakes at Kurtosh are hard enough to resist as it is. Add a layer of Nutella within the pastry spiral and a crisp glossy exterior and we've got no chance. Don't miss the choc-chip and Nutella babka either – a brioche loaf with decadent chocolaty swirls. Most Sydney pizzerias serve a Nutella dessert pizza or calzone and to be honest, it's hard to go wrong. Rosso Pomodoro at Balmain still has us swooning with their roast almond sprinkled version, while La Piadina at Bondi does cute mini Nutella-filled pockets. But check out the bulging Nutella calzone at newer favourite Queen Margherita of Savoy, in Cronulla - topped with locally made gelato from Frangipani, if it pleases. OK, it's not officially a degustation, but Piccolo Me offer enough Nutella-pimped drinks and sweets to make the dream a reality. 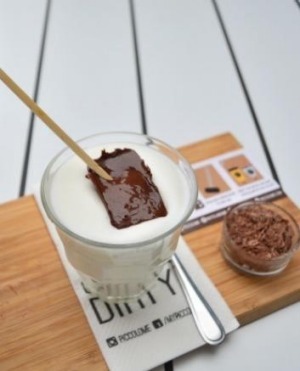 Try the bomb – a block of Nutella on a stick to stir into warm frothy milk, the "nutellagato" – an affogato with Nutella and vanilla ice-cream, double ristretto, chocolate flakes and crushed hazelnuts, or the "esprookie" – a syringe filled with espresso to squeeze into a Nutella-lined, cup-shaped cookie. The Nutella-themed treats continue but we'll stop there – just rest assured, Nutella cravings will be sated.